“Sticking” to yesterday’s hockey theme, I decided to feature a drinking apparatus today vs. an actual drink recipe. • Named after Fredrick Stanley, the 16th Earl of Derby (in Canada), who was a big ice hockey fan back in 1888. Fred Stan (that’s what I’ll call him for short), attended the 1889 Winter Carnival in Montreal where he saw the sport first hand. That’s when Fred Stan became real active in the sport. One of his sons, Arthur, played a key role in forming the Ottawa Hockey Club. • And that’s the birth of the Stanley cup! • In 1896, the Winnipeg Victorias started the tradition of drinking champagne from the top bowl after winning the championship. • Only one of two trophies in pro sports to have the winner players, coaches and management engraved on it. The other is the CFL’s Grey Cup. Traditions• A new cup isn’t made annually. Each team keeps the cup until another champion is crowned. • Upon winning, the team’s captain picks up the trophy and skates around the ice with the cup. Each player then gets a turn to do the same thing. • A big NHL superstition is that no player should touch the cup until his team has rightfully won it. Some players often refuse to touch the Division Cup prior to the Stanley Cup games. As expected, because championship players can each individuall y spend some time with the Stanley Cup, it’s been in some interesting places…. • In 1962 the Stanley Cup was dropped into a fire by the Toronto Maple Leafs during a party. The cup was in bad shape and needed to be repaired at the expense of the team. • Kentucky Derby winner Go for Gin ate oats from the cup thanks to the New York Rangers. 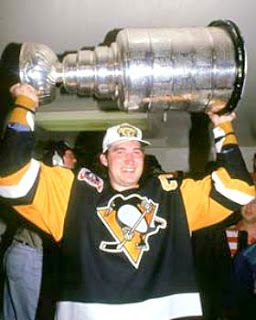 • Pens fans will appreciate that in 1991 the cup was tossed into Mario Lemieux’s pool. FYI – it doesn’t float.